Have you ever wondered how to build a “choose your own adventure” game? Do you like telling stories that offer variable endings and choices with consequence? Do you have little-to-no (or lots!) of experience coding? 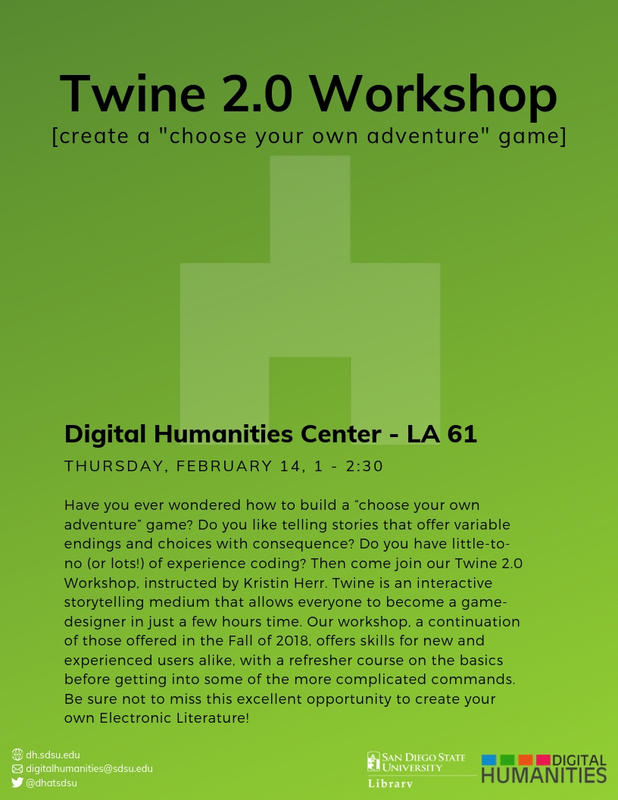 Then come join our Twine Workshop 2.0! Twine is an interactive storytelling medium that allows everyone to become a game-designer in just a few hours time. Our workshop, a continuation of those offered in the Fall of 2018, offers skills for new and experienced users alike, with a refresher course on the basics before getting into some of the more complicated commands. Be sure not to miss this excellent opportunity to create your own Electronic Literature!